Fortnite’s hours watched and peak viewers have decreased significantly. 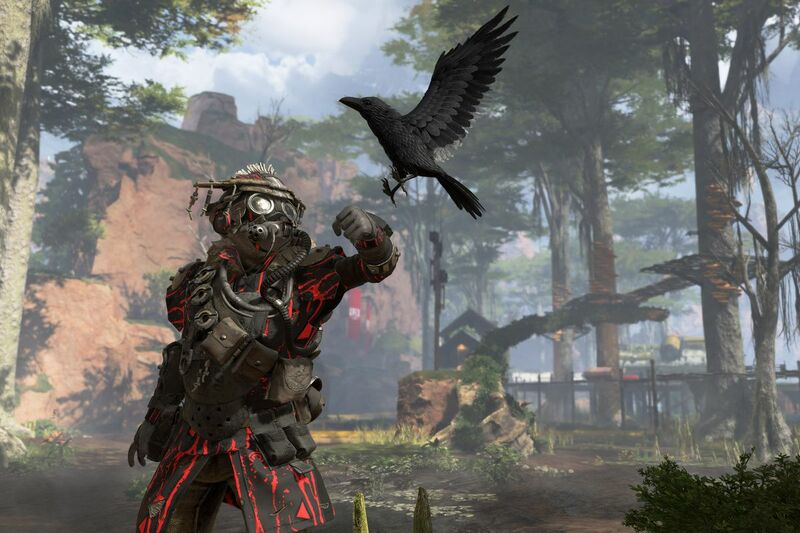 The newest battle royale game trending is Apex Legends, published by Respawn studios. The game reached astonishing milestones since it was released on Feb. 4, gathering over a million players in under eight hours and leading in viewer counts on streaming platforms like Twitch, where it racked up more than a half-million viewers at its peak. But when one game is doing so well, that almost always means it’s affecting other games. The biggest battle royale game in the world, Fortnite, was hit hard on Twitch with the release of Apex Legends. 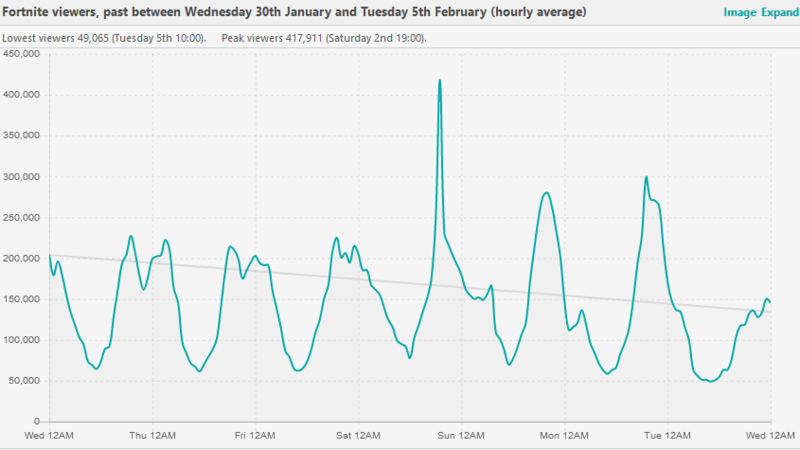 Twitch statistics website SullyGnome has interesting data about hours watched and peak viewers of Fortnite and Apex Legends on Feb. 5. Twitch users watched over 6.3 million hours of Apex Legends on that day and made the game lead the platform in hours watched on that day. Fortnite was the third most-watched with 2.4 million hours, 300,000 hours behind League of Legends. Apex’s peak viewers was over 400,000, while Fortnite’s was 200,000. This is a very common trend on Twitch. New games usually take over the platform for a few days before stabilizing at what might be their trend for the month after release, and since Apex Legends is a direct competitor of Fortnite, it’s expected to hit Fortnite’s stats on Twitch. Some graphs from SullyGnome also show trends for the upcoming days, or at least what we might see today. 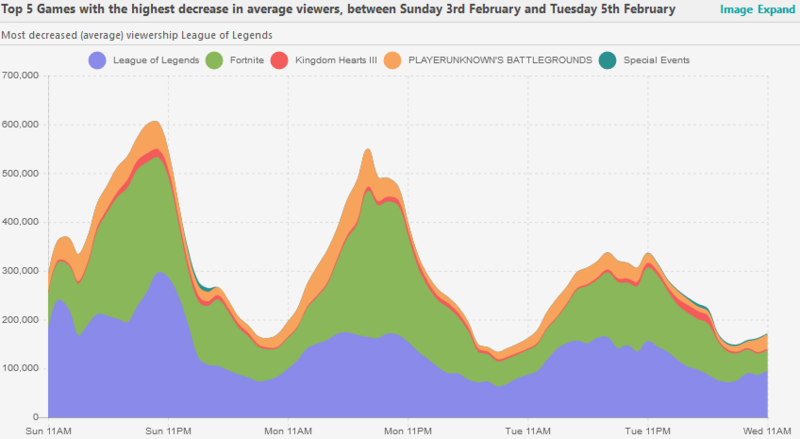 On the far right of the Fortnite viewers graph above, we can see the usual peak viewers Fortnite was getting around the same time every day isn’t reaching the same numbers as in the past week. 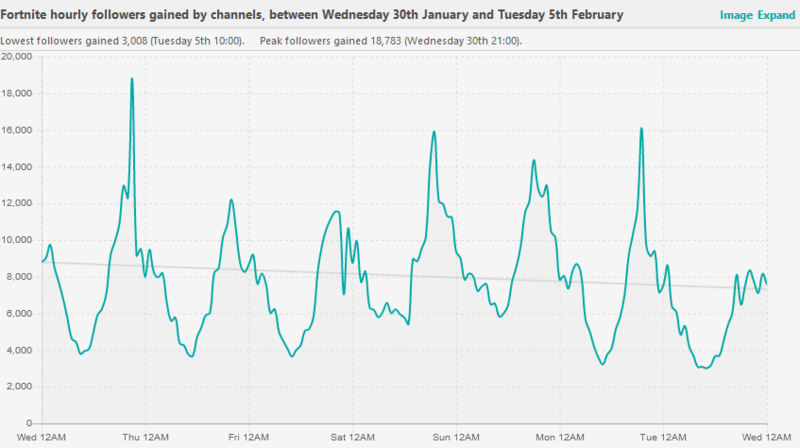 The peak number of followers gained every hour by channels that stream Fortnite was smaller yesterday than in previous days. And from the last three days, Fortnite lost the third-most followers, behind only Kingdom Hearts III and PlayerUnknown’s Battlegrounds. It’s actually too soon to speculate the impact Apex Legends will have on Fortnite’s viewership. Even though people are eager to see if this newcomer will take down the empire that Fortnite built, we have many days ahead to understand if this hit to Fortnite was temporary, or if Apex Legends is here to stay and steal—or, at, least, compete for—the battle royale throne.